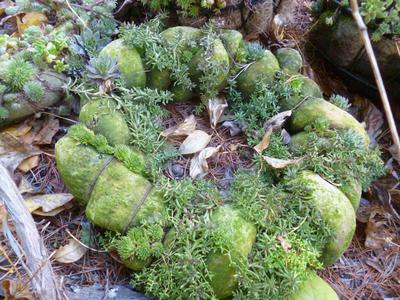 The winter care for tender succulents is a no-brainer; take them indoors. But what do I do with hardy wreaths and other crafts? They don't like going inside for the winter, I know this because I tried it, and the Sedum got aphids and the Semps got mealy bugs, then they fizzled out and didn't recover. The weather here is cold enough for snow, and tends to hover around freezing from October to March. The worst time of the whole season is during the thaw with refreezing of the melted snow and ice creating havoc. The other issue of course is the use of snowmelting salt. Is it best to cover the crafts with leaves inside some wire fencing? Or just let them survive as best they can covered with snow? You've pretty much got it, Belinda - the most important thing is that you must have them in a fast draining area - I put mine on top of a raised bed, away from eaves or anywhere they'll get dripped on (as in; don't put them under trees either). This allows them just to emerge as the weather warms, and there's less risk of the freezing and thawing. The leaf idea is a good one, I've seen that used especially for topiary or globes. Build a fence, then put leaves around the craft to protect it. They need to be about six or eight inches at least, on all sides. Also prevent mice from moving in - make this arrangement of the fenced area after a good frost, so they've already found their winter quarters. Other than that, have patience once they come through the winter. They may look quite shabby and need a renovation to recover their former glory. Have some replacement plants on hand, ready to plug into the empty spots. As you've mentioned, salt is a killer. Try not to use it anywhere near where you'll be overwintering the crafts, even on pathways close to them. It will damage or kill any plant it comes in contact with.